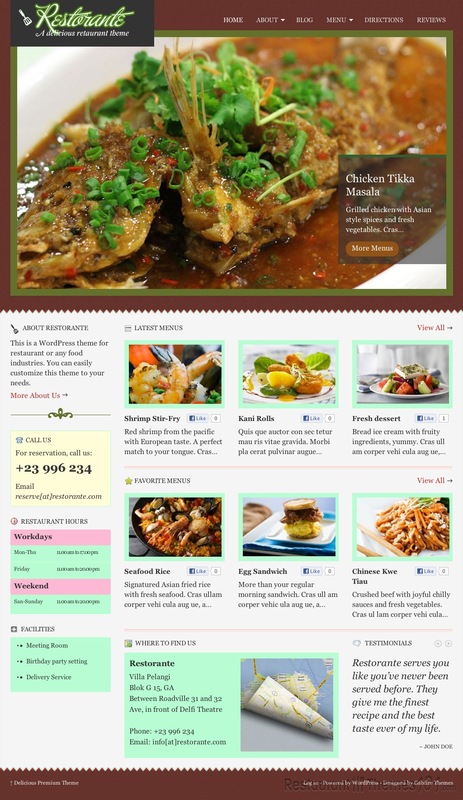 Restorante, a new WordPress restaurant theme by developer Gabfire Themes, combines great color combinations with a focus on images, to bring readers an enjoyable website experience. The design uses a simple and complimentary color scheme, and draws the reader’s attention directly to the focus of the page – the pictures. The first thing you will see when you go to the homepage of the website is a giant picture of a delicious-looking dish. This is where you should show off your best or most popular dish. Unfortunately, this theme does not offer a sliding picture gallery, so you’ll have to choose 1 picture that encapsulates the feel of your restaurant. Under the picture you will find a short “about us” description, followed by a selection of menus and sub-menus, each with their own thumbnail images. Under that, you will find a “contact us” section, and a “location” section with Google Maps integration, as well as restaurant hours. Pretty much everything a reader would be looking for is displayed right on the front page, which is a big advantage over several competing themes. Often times readers will not want to “dig” for the information they are looking for, so if it’s all on the front page, your readers should be satisfied with the site and keep coming back, both to the site and to your restaurant. 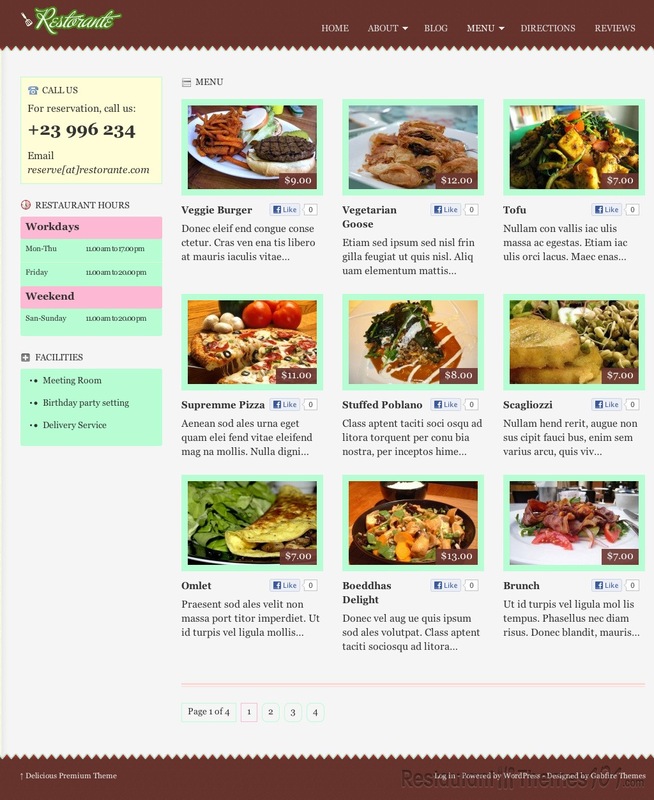 Some of the unique theme features for this particular theme include 2 different category page layouts, custom widget integration, custom page templates, multiple color schemes, and automatic thumbnail resizing. 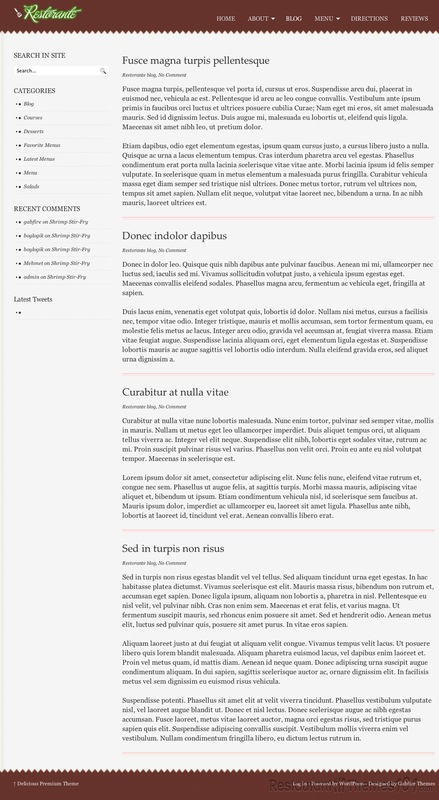 This theme is NOT mobile compatible. 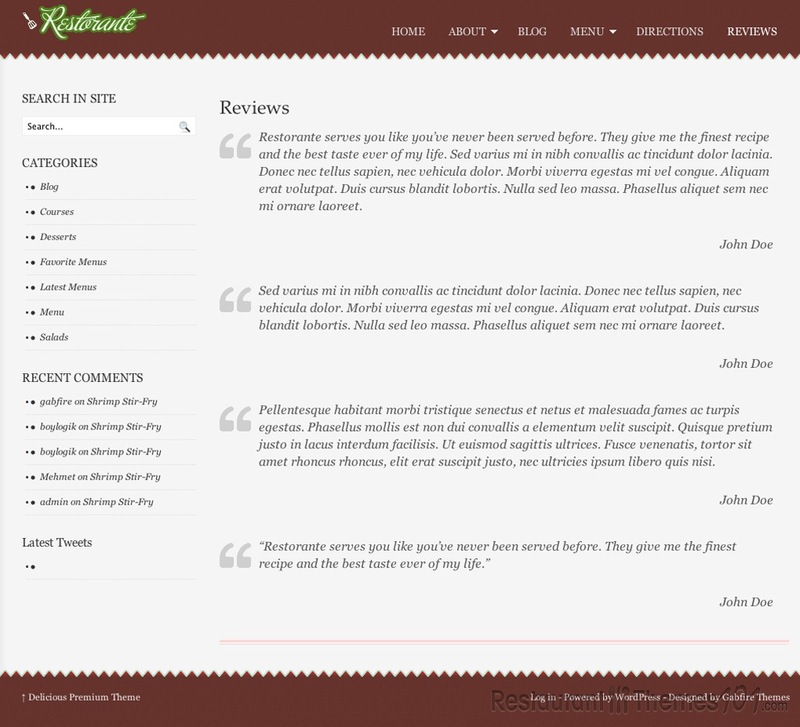 Overall, it is a pretty good theme, but it is lacking in certain areas. The focus on images is good to draw readers in, but the lack of a sliding picture gallery and the absence of mobile compatibility hurt the overall performance of this theme.